I've been running GPS on my motorcycle for about 4 years now. Though I'm admittedly cartographically-challenged, I mainly use GPS for an accurate speedometer, trip computer and services-locater. I'm currently using a Garmin 60CSx, which is on long-term loan from a GPS vendor (thanks!). I've used AAs in my GPS units instead of powering off the bike's electrical system, so battery life has been a big concern, particularly when running the backlight during my early-morning (and evening during certain times of the year) commutes. I'd been using good ol' Kirkland (Costco) alkaline AAs because they seem to last as long as anything else and only cost about .21 each. 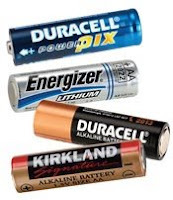 However, in November 2007 Consumer Reports tested a bunch of AA batteries in digicams and portable CD players and determined the Energizer "E2" Lithium was head 'n' shoulders above the rest, so I decided to give 'em a try. While the retail cost can be as high as $2.25 each, with some searching I found prices closer to $1 each. In any event, the cost is at least 4 or 5 times that of my trusty Kirkland alkalines, so the deal would be off if they didn't deliver much greater battery life. After running the Energizer Lithiums for several months, I'm happy to report that they delivered as hoped. While my tests haven't been scientific, I'm confident that the Energizer E2s are lasting a minimum of 5 times longer, and perhaps as much as 8 times longer. Plus, the power seems to stay at a maximum level (as measured by the GPS) before dropping off quickly, whereas the alkalines would slowly fade from maximum power, often forcing me to change them out before they were totally discharged to prevent them from "dying" in the middle of a ride. If you run AAs in your GPS, give the Energizer E2 Lithiums a try. Be sure to change your GPS' battery setting to "Li" if you do, and check this old post for a hint to prevent vibration-induced shut-down. Addendum 4.17.08: I've received a couple of inquiries since I posted the above. Seems some folks have tried the E2s, but their GPS units either won't power-up or they shut down within a few seconds. I checked with Garmin and this is a known issue on units with a sensitive over-voltage circuit. For instance, my Garmin 60CSx will shut down if voltage over 1.65V is detected. While the Energizer E2s are advertised as 1.5V, when brand new they apparently may put out as much as 1.65V or more . The solution is to first drain a little juice; my method is to stick the Lithiums in a flashlight (I keep a 2-AA Maglite in my tankbag) and turn it on for a minute or two. An alternative may to attempt to power up the GPS multiple times until the repeated attempts have drained enough voltage. LOVE those batteries! I use them in my digital camera too.